Along the sea front in Viareggio, a few steps from the beach and the park the Centro Residenziale Maestoso can offer you the opportunity to stay in indipendent apartments. The Maestoso is situated at the second floor of one of the most famous �Art Nuoveau� buildings in Viareggio which has been completely refurbished. 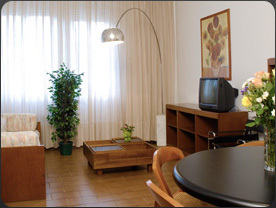 In ours holiday apartments you�ll spend your time though free in comfortable, bright flats.